Can you feel the … Tension? American comedian Jerry Seinfeld stated that the architecture of humor is all about digging into a tension point and the releasing that tension through the punch line – with the resulting laughs. His highly successful TV show featured a group of rather unlikeable characters who were only remarkable in how each was so selfish and petty. People are that way, but we would like to think that individually we are less so. Seinfeld’s show would make you uncomfortable in how the characters would do things that were two or three levels beyond anything you would probably do, but just getting close was enough to release big laughs from its audience that was the not coincidentally the highest in the US for several years in a row. Good marketing works in much the same way – identify a tension point in the lives of your targeted consumer and then release that tension with a brand solution. Apple’s successfully touches on the tension point that we are all one big mass of people who all do the same thing – like sheep. Apple offers the solution of individuality. Your iPod may be the exact same model I have, but you know yours is very different because how you have made it uniquely yours with apps and content. In marketing we often confuse tension points and need states, but they are different. Tension points go deeper. Tension points are always emotional, while a need state can often be purely functional also, like: I’m thirsty. But what tension points do is get beneath that need state to uncover the real driver. ‘Self indulgence’ as a need state is interesting. Connect it to a deeper tension point of ‘feeling unappreciated’ and you understand a much stronger desire that your brand message could unleash. If all you have is category based segmentation you are going to be stuck with category need states, which is why your promised brand benefits are probably very similar to those of your competitor. But if you have combined a broader lifestyle understanding of your customer along with the category needs you know so well, you will be able to dig deeper to uncover the underlying tension point driver. A Balancer parent is trying so hard to please everyone at work and at home that they often feel guilty when they inevitably come up short – there never is a real balance. The Fullfiller parent segment is more career driven, bordering on, and maybe even crossing over into being a workaholic. Their tension point for them is all about missing the opportunity and falling a step behind. Aligning the benefits of your multi-dimensional brand based on their motivational effect on the consumer is a more consumer centric manner in articulating your brand strategy than the usual brand architectures and brand maps that are typically brand centric rather than consumer centric in structure and content. These benefit corridors are driven by need states. And those need states are driven by corresponding tension points. The motivational hierarchy model below reflects both the underlying need state as well as the tension point that lies below that in the home living category (buying a house or apartment). 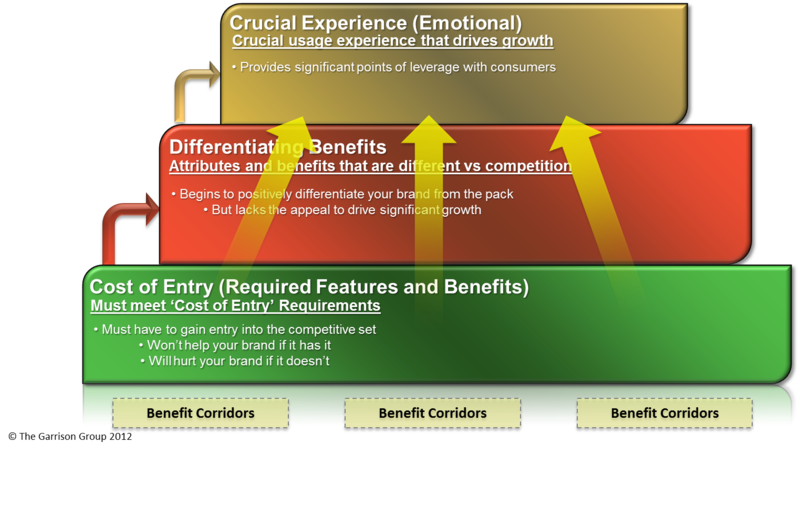 Building brand benefits that correspond and increase motivationally from cost of entry benefits to get your band into the consideration set, and then moving upward to differentiating benefits, culminating into a crucial experience is relatively easy to construct at this point because you know who you want to reach… and what really drives customer brand and product decisions. Most tension points tend to be rather negative because they are what we worry about – what keeps us awake at night. But because these tension points are so powerful in our consciousness, we as marketers don’t necessarily need to remind people of their fears, we just need to offer them a solution. The solution should be rewarding and can even be uplifting – where you want to take your brand. It has been broadly claimed that the best commercial ever was an Apple commercial called 1984 that launched Macintosh – why 1984 would not be 1984, in reference to the famous George Orwell novel of the same name. The commercial comes very close to negative territory, but has a promise throughout of something uplifting, But then Apple, who very much understands tension points, went negative when they launched their office software product which even Steve Jobs at the time quickly realized was a mistake. Several years ago, Coca-Cola went the negative route in touching on the tension point for moms of not getting it right for those big moments – better have Coke available! The campaign was not only pulled almost immediately due to overwhelming negative feedback from the consumer, but also resulted in the firing of the Chief Marketing Officer of the company shortly thereafter. Consumers want their favorite brands to offer the solution, not dwell on the negative drivers. 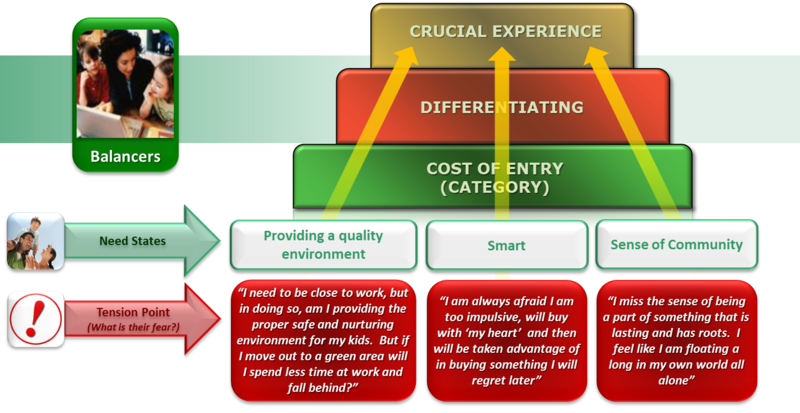 But we as marketers need to understand those underlying tension drivers if we intend to offer the optimal solution. Steve Jobs wasn’t fired for the lemmings advertising, but it didn’t help him with the Apple board at the time. But when he famously returned nearly ten years later he stuck to the tension point strategy he knew, but he always released that tension with products and brand communications that inspired us to be more than mundane and ordinary – to be people that individually have the power to create and to change things for the better. Throughout my life, I’ve lived in different countries ‒ Iran, the USA, Armenia, and Hungary. The one thing I have found to be common is that you can engage the emotions of anyone by asking them about a topic that they are interested in. You can then transfer this emotional connection to an area of your interest. I appreciate that “meeting” doesn’t necessarily mean “understanding.” By understanding the people around you, not only as a statistic, but who they really are and what they think, this is when you can really grow yourself and your business exponentially.